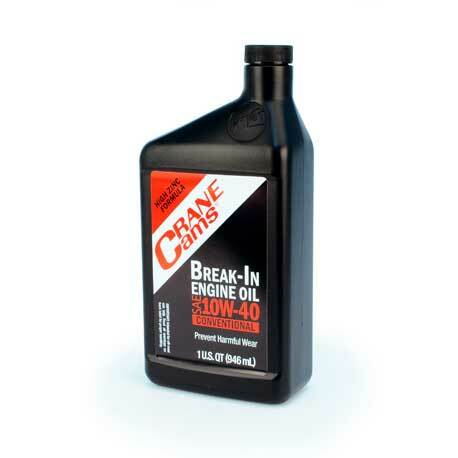 Crane Cams now offers a specially formulated 10W-40 conventional engine oil (#99300-1) to cope with the stresses created using flat-faced follower camshafts. This oil will ensure that the critical first hour of your camshaft’s life will lead to long-term reliability. A formula of advanced petroleum base, combined with an additive package used in Crane Cams Super Lube, using a proportioned zinc (ZDDP) component (such as contained in Crane Cams Super Lube), this oil is intended for use with all conventional fuel types, with no additional oil additives required. Once your flat-faced lifter camshaft is properly broken in, you should continue to use a performance type ZDDP content oil for the remainder of the engine’s life, to ensure longevity. It’s more important­­ than ever to use the properly formulated oil for the initial break-in of your flat-faced follower camshaft and lifters, either hydraulic or mechanical. Oils specified for today's hydraulic roller engines no longer contain the additives necessary to provide the optimum environment for sliding surfaces, especially for cam lobe and lifter interface of a flat face follower design. Fresh rebuilds also need load carrying protection in lifter bores, distributor gears and valve guides. Even in roller lifter equipped engines, this break-in oil is highly recommended and this oil’s additive package is mandatory for flat-faced follower designs. Crane Cams Break-In Engine Oil (99300-1) or Crane Cams Super Lube (99003-1) MUST be used when installing a new Flat Tappet Camshaft and Lifters.